If you want to be able to do it all on the court then you need these Asics Gel Tactic 2 GS Indoor Court Trainers in a Pink and Black colourway. 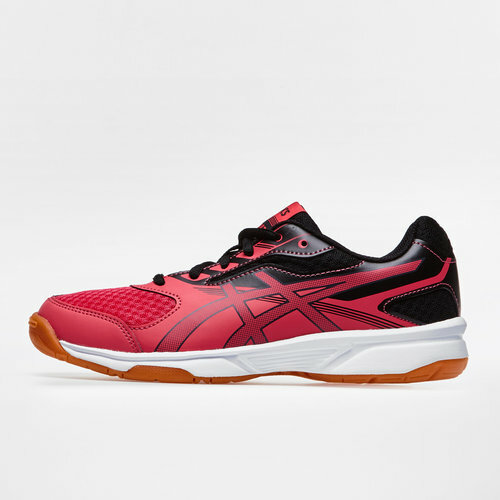 These netball trainers from Japanese multinational corporation Asics have been designed for the wearer to have fantastic footing thanks to the high-grip outsole. These trainers come with a flexible, comfortable upper whilst using California Slip Lasting for comfort and stability. The upper is stitched around an EVA board and is directly attached to the Midsole. The Removable EVA sock liner is moulded to the shape of the foot, which can be removed to accommodate a medical orthotic. These trainers attenuate shock during impact phases and allow for a smooth transition to mid-stance with the Rear foot Gel Cushioning System.